Organising an outdoor festival event? Need a covered stage? We have a selection of gazebos suitable for a number of uses. Our 1.5m x 1.5m gazebos are ideal as ticket booths, information points or loudspeaker stack protection. 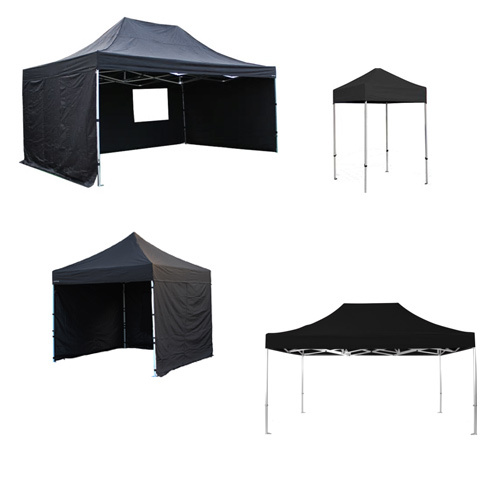 The 3m x 3m gazebo is suitable as a stage cover for solo performers, small bands or DJs. It is also the perfect size for use as a FOH sound/lighting control point, merchandise stall or exhibition area. The 4.5m x 3m gazebo is suitable as a stage cover for slightly larger bands, presentations etc. It is also great for market stalls and retail use. 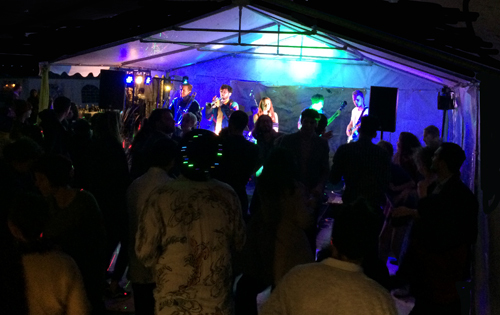 The 6m x 4m gazebo as a stage cover provides a performance area for larger bands, or without the stage can be used for refreshments, exhibition or retail. All our gazebos come with weights, pegs and tie lines as required. We can supply open marquees which can provide superb protection for performers. Available in numerous sizes and styles, the marquees can be open sided or enclosed. Ideal for larger stages where height is not required. Call our team with your requirements for free and friendly advice. 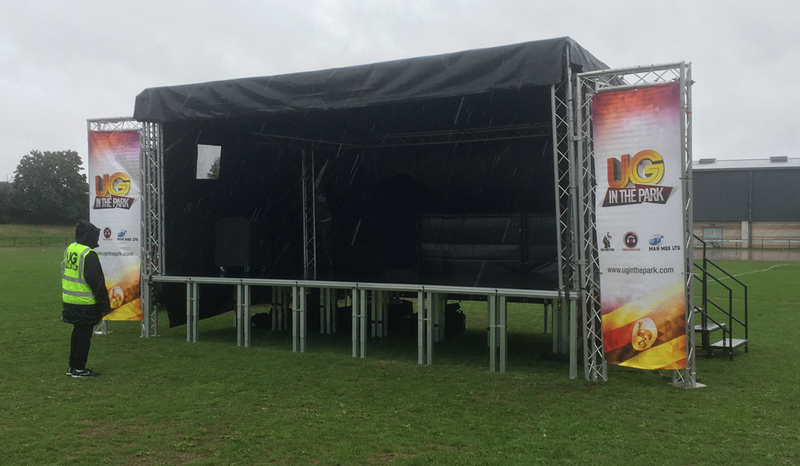 This 7m x 4m stage is ideal for small to medium sized events which require a little more festival authenticity and the flexibility to rig lighting fixtures for a small lighting set up. The stage roof will accommodate a stage of 6m x 4m. The Trilite truss is mounted onto the stage itself and is secured using clamps, ballast and heavy duty tie straps as appropriate to the terrain. The flat roof slants to the rear to ensure any rainwater does not collect on the roof. Rear and side walls are included. The stage itself has a non-slip hexagrip surface and can be set up to 1m in height. The stage comes complete with steps and safety rails as required. 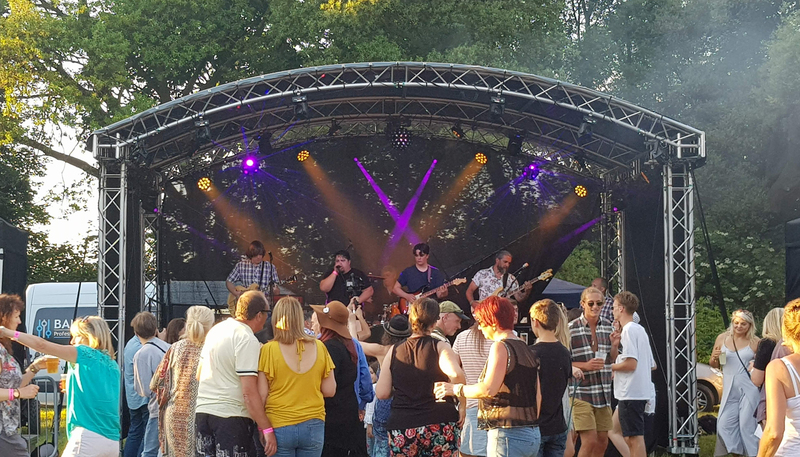 This 6m x 4m stage is ideal for small to medium sized events and boutique festivals which require an authentic festival vibe and the flexibility to rig lighting fixtures for a more comprehensive lighting set up. The stage roof will accommodate a stage of 6m x 4m. The quad truss is constructed onto the ground and is secured using ballast and heavy duty tie straps as appropriate to the terrain. The ARC roof provides the ultimate protection from rainwater. Rear and side mesh walls are included. 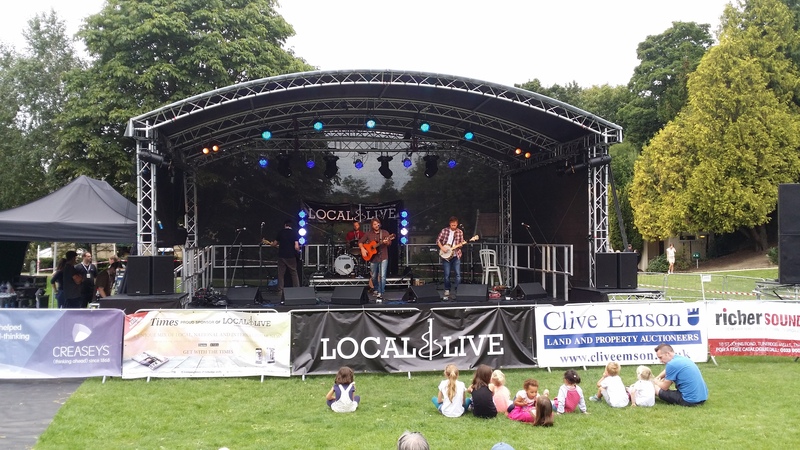 This 8m x 6m stage is ideal for medium sized events and festivals which require a professional festival stage and the flexibility to rig lighting fixtures as required. The stage roof will accommodate a stage of 8m x 6m. The quad truss is constructed from the ground up and is secured using ballast and heavy duty tie straps as appropriate to the terrain. The ARC roof ensures effective protection from rainwater. Rear and side mesh walls are included. The stage itself has a non-slip hexagrip surface and can be set up to 1.4m in height. The stage comes complete with steps and safety rails as required.